This was a very early - and now relatively rare SD. Systems EPROM burner board. 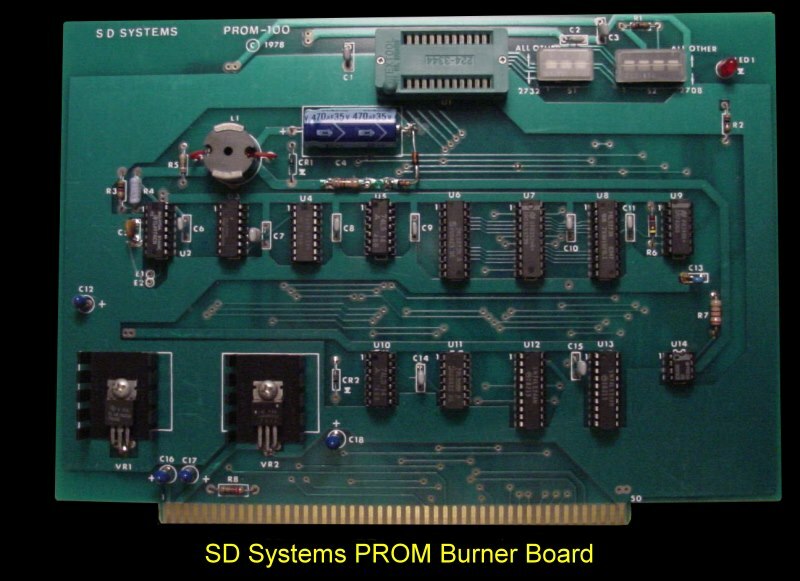 The SD SYSTEMS PROM-100 board was a high performance circuit capable of programming the industry standard 2708 1K X 8 EPROM, Intel's 2758 1K X 8 EPROM, 2716 2K X 8 EPROM, 2732 4K X 8 EPROM and Texas Instruments 2516 2K X 8 EPROM. The PROM-100 was selected for the appropriate EPROM type through dip switches S1 and S2. Another notable feature of the PROM-100 was the 25V programming pulse generated on board, eliminating the need for an external 25V supply. The board occupied I/O addresses 68H, 69H and 6AH.